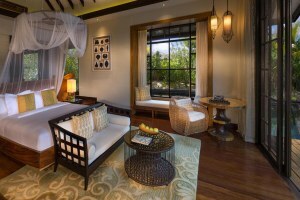 Set 20 minutes from the Malé Airport, Jumeirah Vittaveli offers everything you hoped for and more. Surrounded by Maldivian charm and stunning landscapes, Jumeirah Vittaveli provides you with the leisure, pleasure and respite that you desire. 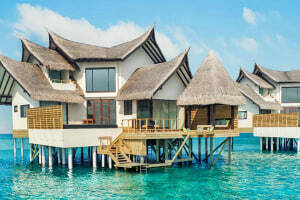 An early morning swim in your private pool, warm sand underfoot at the beach, diving into the clear lagoon from your overwater villa, skating at the very first ice skating rink in the Maldives. Exemplary service enhances this experience as you explore the wine library, kids club, culinary delights and water sports. The Talise Spa shall breathe new life into your tired body and mind, and the 24-hour fitness center adds a vigor to your step. Be it with your loved one, family or friends – every moment will be a precious memory created. Opulent designs, boundless leisure and untouched beauty. A breath-taking fine dining venue, Fenesse floats over the waters and allows for stunning views while you bite into succulent meats and fresh seafood from the classic french palate. Keep in mind that Fenesse is closed on Fridays. Go on a culinary journey at Swarna as they seat you down at a palatial dining setting, with the Swarna Thali served on an oversized copper plate. World Luxury Restaurant Awards in 2016 honoured them with the title of "Best Indian Cuisine in Asia". Open-air dining cabanas, a separate "Gold Menu" that serves gold in edible form in every course and the finest ingredients from around the world - this enriching dining experience must not be missed. An all day dining venue, Samsara serves a delectable breakfast and dinner buffet. Specialising in Asian and International cuisine, the Maldivian style is integrated into the food for an innovative and appetizing experience. Fresh sashimi, prime beef burger or the à la carte menu, you will savour it all. The very first ice skating rink of its kind in Maldives, 87 square meters of skating area is all yours while viewing seats are provided for the guests as well. Play a round of ice hockey or just waltz around and practice your moves. This is a delightful experience that ends on the sweet note of an ice cream sundae treat. Ensure that your kids have as much fun as you do on this vacation with the help of Kuda Koli Kid's Club. With an indoor and outdoor play area, kids club and teen lounge there is plenty for all to do. Weekly activities like pizza making, T-shirt painting, treasure hunts and pool games will keep them busy and happy. You can avail babysitting services starting from $25 per hour. Work out at one of the most inspiring locations at this over water fitness center. A complimentary personal training session shall guide you towards your goals. You also have the option to take your work out to the beach with circuit training and stretch classes. Private and group yoga sessions are also available for those who are interested. The Talise spa, translates the meaning of Vittaveli into their treatments. Meaning space and light, the therapists take a holistic approach to healing, with ingredients procured from local communities. Spa treatments with your partner in nature's paradise is an intimate and romantic moment, while all treatments cater to the health benefits according to the individual. The expansive swimming pool is perfect for a refreshing cool dip in the early evening light. With white loungers beside it, enjoy a delicious cocktail with great views of the sea unfolding before you or just bask in the sun catching that perfect tan. We recommend that you apply strong sunscreen that shall protect you from the afternoon sun. Sit down at the shore and dine Maldives style - at the beach - at MU Beach Bar and Grill. If you love grilled food, try their hot lava stone speciality where you can grill your food at the table. Lunch serves delicious Tapas and Pinchos accompanied by a choice of cocktails and mocktails. Taste the salt in the breeze, feel the soft sand beneath your feet and dig into the sumptuous feast before you. A rustic retro-bar encircled by the Indian ocean, B4R Main Bar is a great spot to enjoy your cocktail as the resident band livens the place. Sit back on the sunbeds or retreat to a private wooden cabana that has been prepped with chilled towels, sunblock, fruit skewers and sunglass cleaners. Overwater hammocks are a cool addition to this bar. Kindly note that the allowance for checked-in luggage for the private seaplane transfer is 20 kilos and hand carry is 5 kilos per person. If this is in excess, $5 is charged for every extra kilo. ; The tap water in Maldives cannot be used for drinking. Two bottles of complimentary water are provided, following which extra bottles can be purchased at the resort. ; Due to privacy and safety concerns, the use of drones by any guests is prohibited within the property. Although children are most welcome at the resort, pets are not allowed at Jumeirah Vittaveli. Children aged 0-11 years can use an existing bed or extra bed at no additional cost. The maximum number of extra beds that can be added to a room is 1. Adults will be charged at USD 360 + taxes. Maldives requires every resort to charge $6 per person Green Tax for each night of their stay. This is a compulsory tax incurred in all hotels and is directly payable at hotel. Kindly note that Jumeirah Vittaveli hosts a mandatory Gala dinner on 24th and 31st December. The charges are to be paid directly to the property. There are three options of reaching the property: shared or private seaplane and a luxury catamaran. Keep in mind that the flight transfer is only available for passengers arriving between 6:00 AM – 3:30 PM, so if your flight is after daylight hours, please opt for the catamaran that shall take you safely to the hotel. The prices for the transfers are: Shared Seaplane Return Transfers - USD 245* per adult (12 years and above) and USD 125* per child (2-11 years). Infants below 2 years without a seat are provided with complimentary transfers. Private Seaplane Transfers - USD 2,100* round trip and USD 1,260* one way (Max. 10 people) Luxury Catamaran Return Transfers - USD 250* per adult (12 years and above) and USD 125* per child (4 – 11 years). Complimentary boat transfers are provided for infants (below 3 years). Please share your arrival and departure flight details at the time of booking.